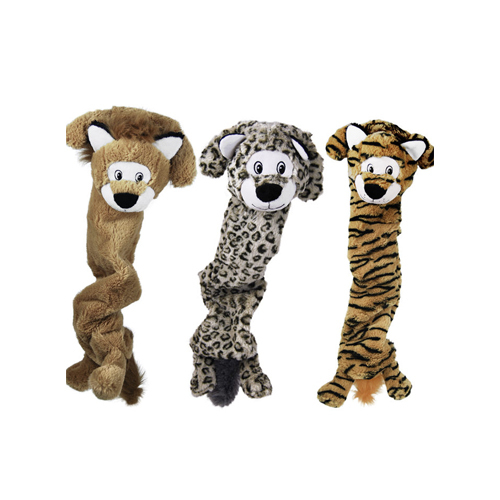 The KONG Jumbo Stretchezz are tugging and fetching toys for dogs. These toys can be stretched to a total length of 75 cm. To stimulate play, squeakers and crackling noises have been added over the entire length of the toy. Available in three variants: lion, tiger and snow leopard. Stimulate your dog's hunting and playing instincts with the extra long Stretchezz from KONG. Fully stretched, this toy is 75 cm long. Three squeaking and crackling sounds have been added to the tiger, lion and snow leopard. This provides even more entertainment. You can use the Jumbo Stretchezz for tugging and fetching games with your dog. Have you used KONG Jumbo Stretchezz before? Let us know what you think about this product.